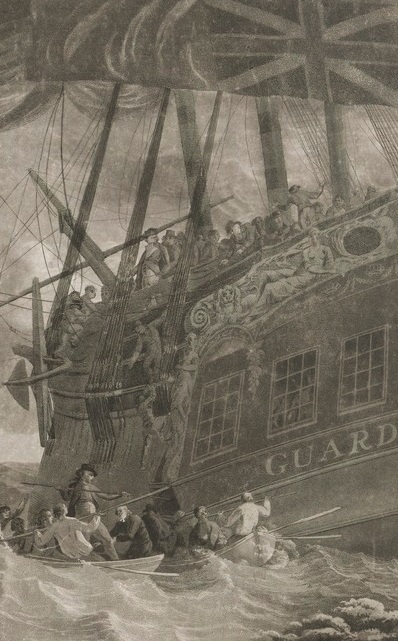 "Part of the crew of His Majesty's Ship Guardian endeavouring to escape in the boats," Robert Dodd, 1790, National Portrait Gallery (Australia). I've examined a print of the Guardian frigate in the past, also created in 1790. 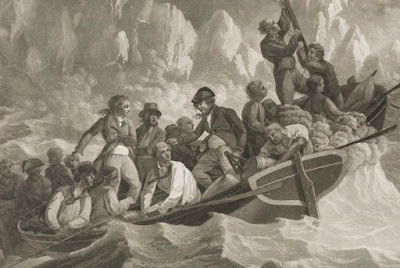 That Bowles print was an idealized representation of Lieutenant Edward Riou aboard his shattered vessel. Robert Dodd's print is also somewhat idealized in its portrayal, but decidedly more harrowing. 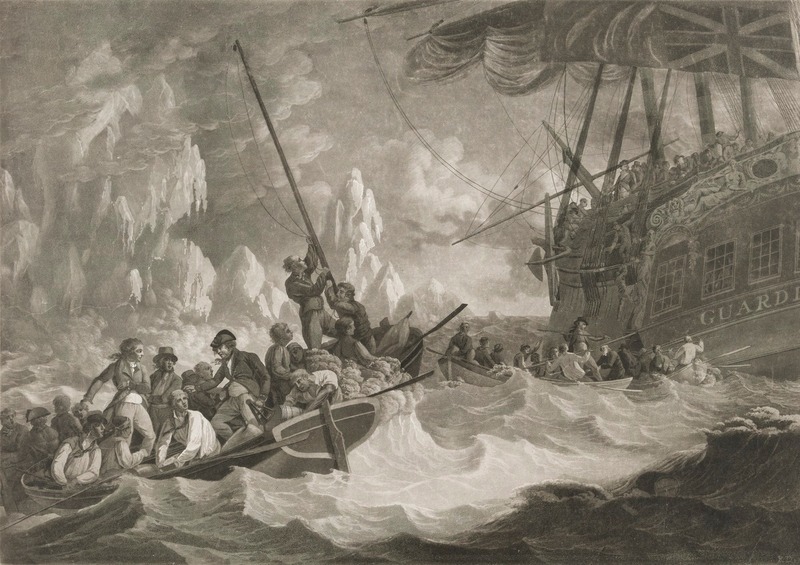 Walls of ice threaten the stranded ship, and the boats are tossed on threatening waves. When the Guardian, bound for New South Wales with convicts aboard, struck ice and was stranded, many of her crew and passengers took to the boats. We see only some of the 259 people that crammed onto the five boats. Of these only fifteen would survive. Riou managed to get ahead of the rapidly gaining water in his hold (at its height, there was sixteen feet of water in his ship) and made it safety. His tale of survival would be the inspiration for the third act of Patrick O'Brian's novel "Desolation Island." Looking over the larboard rail amidships is Lieutenant Riou. He stands with a certain posture of confidence that the other figures in this piece lack. The men around him scrambling across the deck and down the side into the boats wear trousers, jackets that end at or below the waist, and round hats with narrow brims and tall cylindrical crowns. Keeping his balance and giving instructions to the men in the boats, the central figure in this detail is Master Celements. His left hand holds an octant, a navigational instrument that will be essential to the survival of the men. The men are ill-equipped for surviving in open arctic waters. Many are without jackets, some without even waistcoats. Many wear loose black neckcloths, looser than I am accustomed to seeing in images of sailors. Some have work caps, some round hats with narrow brims and tall cylindrical crows, and one (an oarsman in Master Clements' boat) wears a cloth wrapped around his head. Movies, TV shows, and reenactors often portray sailors with a cloth wrapped around the head, but this is the first image I've seen of it. It is possible that this sailor has bandaged a wound, rather than wearing it for comfort or fashion, but with his back turned toward us, it is difficult to say. The only other figure of note is the tar standing at the mast of his boat, who wears a double breasted jacket and a white neckcloth tied in a fancy sort of manner.